Today Corbett talks with Richard Beyer, a consumer who lived through a bad spray foam installation and now advocates for spray foam training and licensing. 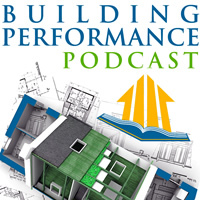 In his monthly tour of a building forensics investigation of a home's performance, Corbett shows how the problems of a new home can be measured, prioritized, and improved. Measured home improvement is the name of the game, even with a 6-month old house. Coolest Infrared Video Ever Made! Seriously, I challenge the world to throw down another video that uses infrared thermography that's slicker than this one! Any guesses on how we created it? HINT: You have to know a bit about thermal cameras to think through this technically.